At a time when many cameras had only flipup viewfinders and exposure was judged from sliding scales that matched the photographers estimate of light source with film speed, the Super Kodak Six-20was a marvel . 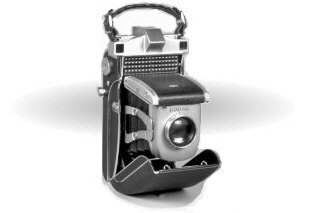 Joseph Mihalyi and Walter Dorwin Teague designed the Super Kodak Six-20 to be the first production camera with automatic exposure control. It was perhaps only the second Kodak folder with a rangefinder. Production values were generally high. The main body shell was, like those of the Medalist and Ektra, of cast alloy. The unusual double clamshell design provided good protection against dust and for the lens and mechanism. Lensboard alignment, the nemesis of folders, was aided by the top door that was attached to the lensboard which was also supported by two knee struts on each side. Perhaps unfortunately, though, folders require folding linkages between lensboard element and mechanisms mounted in the main body and perhaps this was responsible for the unreliable operation of the Super Kodak Six-20, which apparently spent a good deal of their time shuttling back and forth to Rochester for repair. The Super Kodak Six-20 produced eight 6x9 images on a roll of 620 film, the same film stock used for 120, but wound on spools with a smaller core and thinner flanges. Film was advanced by a crank, which also cocked the shutter. The Super Kodak Six-20 had a wide-based rangefinder that employed four prisms, five objectives and two mirrors to create a combined rangefinder/viewfinder. The lens for the Super Kodak Six-20 was not listed in the otherwise complete Kodak Reference Manual lens data sheets. Brian Coe lists an f/3.5 Anastigmat Special in a Compur shutter, presumably about 100mm. Anastigmat Specials of this period were 4-element Tessar designs. Exposure setting was a shutter speed preferred design. The lens diaphragm was coupled to a large selenium cell, just under the rangefinder/viewfinder windows. When the shutter release was pressed, the meter needle locked to the appropriate position; in turn, a spring-loaded sensor in the shutter 'read' the needle position and set the correct aperture. Metering did not include adjustable emulsion speed; Super Kodak Six-20s were calibrated for Kodak Verichrome or Plux X, films with an ISO (ASA) index of about 50. Of course faster films could be used with a filter, but use of Kodacolor, with an ASA of 20, would have been problematic. Some owners might have experimented with a pola-screen. .According to Brian Coe, 719 Super Kodak Six-20s were produced from 1938 to 1944. Unlike the Ektra and Medalist, the Super Kodak Six-20 was not designed for the advanced amateur or professional, but for the occasional photographer who wanted to ultimate in automation. It is interesting to conjecture about who Kodak believed would be an audience for a Kodak folder that was priced at $225 or 50% more than the Medalist and the second most expensive camera in Kodak's line. Kodak Monitor 620 with no rangefinder or exposure meter and a slightly slower version of the same lens that sold for $48.25. The Anastigmat Special was good, but not a match for the excellent f /3.5 Ektar of the Medalist. Early-adopter journalists might have been attracted to the idea of auto-exposure, though most would have trusted their trained eye over some new automation. The new rapid film advance would also have been attractive for this market. At about a quarter of the price of a new Ford, this model would certainly have been difficult to justify to an editor, but the deal breaker would probably have been the Super Kodak Six-20's unreliability, anathema to those who must get the picture. Most of these cameras would probably have found their way to collectors or amateurs with lots of disposable income. Slightly over 700 Super Kodak Six-20s were made. Like the Ektra, the Super Kodak Six-20 found no role in the military during WWII, the salvation for the Medalist during this period. and both the Ektra and Super Kodak Six-20 were withdrawn from production. So few Super Kodak Six-20s were made that when they do come up for auction, they come very dear. Typical prices are from $1000 for rough examples to $4000 for those in mint condition, though 70 year old selenium cells are unlikely to be reliable, even if they still operate.